No race on the horizon and no training plan of any sort. Swimming- I am struggling with my freestyle. It is only drill work until my stroke improves to become a bit efficient and it bears some semblance to swimming. Biking – I am not confident with cleats, not getting faster on the hill climbs and getting an inexplicable neck/shoulder pain after 90 minutes of biking. Running – I haven’t done any sort of speed work in the last one year, so my pace has gone to hell. Gym – I have just started working on it, so am playing with baby dumbbells and plates. Not to complain, just laying out the facts. Everything seems like an uphill task. Each day is “put your head down and work” sort of a day. A far cry from the days of marathon training, where each speed workout would end on a high, each tempo run left me finished, and the long run was long and satisfying. No sir, now is the time to just get through the mundanity. Yes, of course, there are minor breakthroughs, small highs during some workouts, but by and large it is grinding work. 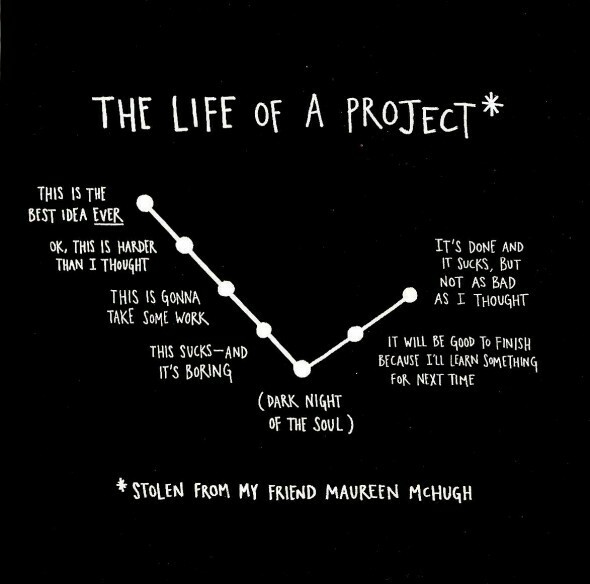 All projects have a certain trajectory. And this is where I am today. At the trough. Like when I was writing my book, in September 2014 and I could not find either an editor or a publisher, I was on the verge of giving up. Like when training for my marquee race the Rotterdam marathon in 2016, I floundered while I trained for SCMM earlier that year during November- December 2015. I was unable to hit my paces through that long training period and I wondered how would I ever make my Boston qualifying time in Rotterdam. Whether I should just quit now and start afresh the next year. Like when training for Boston 2018, running up and down the hills, relentlessly, just took everything out of me and left me so empty, that I just did not see myself making it to the next workout. At all those points when I asked myself why was doing this, and I found an answer, as I had a goal. A visible end. But today, in this time of darkness, I question myself, why am I doing this and there is no answer. Emotions are riding high these days. And not the positive kind. Frustration, when I don’t get seemingly simple corrections in my stroke…I mean how hard is it to keep my knees straight while kicking when I swim! Struggle, as I see my speed on the bike drop to my running speed while climbing up the Walkeshwar hill! Despair, as I see the pace that I finish my long runs at, Sunday after Sunday! Boredom, with the repetitiveness of the gym work! I am doing what I am doing because I have to. To get better. That’s it. There is no instant gratification, like an Instagram post with 100 likes, but it is work in progress, like writing a book. My no-goal training present is like a dark tunnel, a long dark tunnel. I cannot see the light at the end. And I need to keep going. Because I know that it is there. I just need to keep moving ahead. That’s why we need friends to support us. A coach to motivate us. Right now, it is time to do the work just to get stronger. Mentally as well as physically. To hang in. Let me give this time my best. That’s all. Welcome to the world of Endurance Sports! Both your running as well as writing are energizing. Even if this one appears to be in dispair, this is just a phase that needs to be lived one day at a time. Being a role model which you are is invigorating as well as frustrating. Keep adding, changing never subtracting…. © 2019 The Running Soul. All Rights Reserved.